Whose DNA it is anyway? A question arrived by email a couple of days ago that left The Legal Genealogist simply shaking her head. Even the fact that this reader has to ask the question just blows my mind. Yes, dear reader. 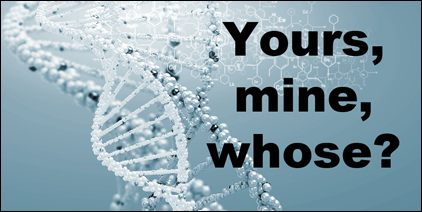 Yes, you own your DNA. No, you didn’t give it away when you agreed to test at the request of your cousin. And no, there is nothing — nothing — that is right about your cousin refusing to give you access to your results. Now I can understand if the cousin isn’t sure how to go about giving her cousin access to the results. At Family Tree DNA, by contrast, it couldn’t be easier: each and every test kit has an individual kit number and an individual password, and giving a cousin access to the cousin’s own test results is simply a matter of giving the cousin that log-in information. And I can understand if the cousin who paid for the test is concerned that perhaps somehow her own access to the results she paid for could be lost. That can happen if, for example, the cousin who was tested chooses to change the password or to delete a test. If that happened with a test I’d paid for, I’d hate it. And I’d certainly try to convince my cousin to give me access again or to allow me to arrange to have the test results restored if possible. But the bottom line here is, the DNA results belong to the cousin whose DNA is being tested, not to the person who paid for the test. Yes, the cousin who paid for the test may have to work out how to give the cousin whose DNA was tested access to the results. But there is no question whatsoever — none in any way, shape or form — about the question of whether she should give her cousin access. I have had many cousins tested on my dime. They always have access to their DNA and I also provide them with their raw DNA download on a flash drive. What a great idea, to provide the flash drive! Hadn’t thought of that myself. all I can do is shake my head. Yep. Amazing that the cousin isn’t cooperating. Ethical standards are one thing, but do they carry any force of law? Legally, does the cousin have to share the results? Would that depend on the state(s) they live in? I’m not 100% sure, Craig, but suspect every state facing the issue will decide the access question in favor of the person whose DNA was tested. [Apologies for posting as a reply to another tread] Statutory Law is one thing. Common–or judicial–law is another thing. I suppose the “Working Code of Ethics” by a self-appointed board of experts would be a key underpinning for a court decision. By one or many of the states, or even the federal government under some guise. This may be a topic the Legal Genealogist would want to be in front of, and not behind of. I tested with FTDNA. Their terms implicitly state that they will NOT test a DNA sample without the written consent of the donor (NOT who paid for it). If your reader knows who the testing company is, all she needs to do is write to the company and revoke permission unless she gets access to it. The testing company is obligated in this matter and I am sure they will block all access to those test results rather than risk being shut down by the government. It gets a little more complicated when it’s not FTDNA because of the way accounts work at the other companies but yes I think any company would revoke all access if the person tested required it. How cruel to withhold information from the donor. People in families never cease to amaze me what with refusing to share pictures and info, stealing family heirlooms, and now withholding DNA results. I can just imagine how family members feel about the “stinker” in the clan who refuses to play nicely in the sandbox. Gives us all a bad name. This one has no excuse at all, Sue. It’s the donor’s data. She is sharing it willingly with her cousin, but it’s her data. Period. Statutory Law is one thing. Common–or judicial–law is another thing. I suppose the “Working Code of Ethics” by a self-appointed board of experts would be a key underpinning for a court decision. By one or many of the states, or even the federal government under some guise. This may be a topic the Legal Genealogist would want to be in front of, and not behind of. I am very much in favor of the working code of our genetic genealogy community, Craig, and wish to see it followed first foremost and forever by our community and its practitioners no matter what the law — in any form — does or doesn’t do. That’s a far more important task for a genealogist who happens to have a law degree than leading the charge for a court decision! Don’t know if this is the person I suggested contact you, but the issue was raised in a DNA group recently. Her cousin used AncestryDNA and when she called Ancestry, they refused her request and said they would only let her see them if the cousin approved it. In her case, it wasn’t a matter of her cousin not understanding how to do it, but the cousin simply not willing to do it. Believe the refusal may have to do with revealing something the cousin didn’t want to get out. It’s not the first time I have seen the issue raised and it’s usually by family members who won’t be moved by ethical standards as they care more about guarding family secrets, having control, not willing to share, etc. I can’t comment on particulars, Paul, but I would be shocked given AncestryDNA’s public position on privacy if it was denying access to results of the person whose DNA was tested. I can see any company denying person A access to results of person B even if person A paid for the test. But to give person A access and refuse to allow person B access is wrong by any measure. In the ancestryDNA terms you certify that you have “legal authorization” when you activate a DNA kit. I doubt if even 1% of people have anything in writing when they send in or activate somebody else’s DNA. By sending in a DNA sample for testing, you represent that you are eighteen (18) years of age or older. In addition, you represent that any sample you submit is either your DNA or the DNA of a person for whom you are a legal guardian or have obtained legal authorization to provide their DNA to AncestryDNA. Those same ethical guidelines should be guiding us on this too. If I pay for a family member’s DNA test I consider it to be for the common benefit of myself, that family member, and any other family members, known or unknown, that the results may benefit; this can only happen through sharing. I cannot imagine any “cousin” who would act that way towards another. Unbelievable. It never ceases to amaze me what some cousins will do!! I have a lot of cousins whom I love dearly. But several years ago I met a cousin in my Dad’s line and gave his wife (cousin by marriage?) a copy of the research I had done on his particular part of the family and shortly thereafter the wife put the information out to other family members. I had made the mistake of not putting my name on the sheets I gave her. She never claimed that she had done the research (she’s never done a moment of actual research) but she left the implication that it was her work. From then on, I put my name on everything—but I do willingly share with cousins who are interested. Not the same thing as refusing to share a cousin’s DNA with the donor, but still. . . I too shared my research with a cousin – one I had never met – but whose mother (in her 90s) I had contacted and provided a copy of all my research at that point. It never occurred to me that someone I had tracked down and shared with would post the work on Ancestry with no acknowledgement and without asking. It now makes me angry every time I try to work on my family. I don’t want to confront him because i don’t want to hurt his mother. It leaves you feeling betrayed, and less willing to share. If I wanted the work on Ancestry I would have put it there. I choose to share in other ways – those in which a commercial company is not making money off my years of work. Like archives, genealogy societies in the area, etc. I have mixed feelings about this. I doubt the person who posted the tree on Ancestry meant to take credit for it or deny credit to you, and may have simply been uploading what they had so they could easily add more to it with all the record searches, etc. If someone shared info with me and explicitly told me not to share it, I would try my best to comply (would uploading it to a tree set to private be acceptable? ), but ultimately — and ironically, due to the article we are discussing here — don’t someone’s ancestors BELONG to them? Regardless of the fact that you paid for the test — oops, I mean, did the research? No matter how incredibly expensive the dna test may have been for you — oops, I mean no matter how many years of grueling hard work the research was for you? Obviously we should give credit when possible, and certainly never falsely claim undue credit, but I just don’t understand some people’s hoarding/privacy attitudes. Don’t get me wrong, I understand the concept of sometimes not publishing every detail in order to have someone contact you so that you can SHARE data, rather than them just take it without you ever knowing it benefitted someone. But ultimately, don’t we do our hard work just to “KNOW it”? And for the benefit and joy it may bring to all our cousins and future generations? And don’t our cousins own the “facts” that pertain to their family and deserve to do whatever they want with them to some extent (within reason)? I would add that it’s really easy to limit a public tree to just the information we all NEED to share so that cousins will still have a good incentive to contact us and actually work with us. I am not opposed to sharing. I sent my research to every cousin I located. I plan to share it with local archives and genealogy societies in the communities in which they lived. Yes, the ancestors belong to others as well – but not the research. My research goes well beyond stating facts. When we compile our research, we are making connections, bringing in stories and events, etc. This process moves it beyond a collection of facts – of isolated death index records, etc. My dissertation is available to the public but if someone publishes it under their name on a website or elsewhere it is plagiarism. Both works are copyrighted (copyright no longer requires a great big statement) material and not free for others to post or print without permission. And no, I do not feel that a cousin I shared with has the right to publish my research without any acknowledgement or without so much as asking. The fact that he didn’t bother to ask says something. I think most of us feel the same way, Carolyn: share my work — but give me credit for all the hours and sweat I put into it. Wow, is right. It’s wrong. Not only that, if the cousin who is withholding tries to seek cooperation from your correspondent or other relatives the future, she might not get it. This makes me want to lock my door, not let anyone in, and never venture outside my house again. It’s getting nasty out there! We can sure hope the cousin sees the error of her ways. Sometimes family stuff is weird, but this stuns me. This cousin may think she has a valid reason for withholding info (and may even think she is “protecting” her cousin). But she does not have a firm grasp of the ethics involved. It is not her decision to make. Period. Nor is it the right of the company involved to assign “ownership” to the person who paid. Is there a chance that bringing moral pressure on the company could encourage them to change this misguided and (likely illegal) practice? BTW, my daughter paid for my autosomnal test with FTDNA, and I have full rights to the data. As it should be. I am fine with her having access. She is more into the DNA thing than I am, but you never know when it might come in handy. I’m confident the company will do the right thing if it becomes necessary to go to the company. Under the settings selection on each individual’s Ancestry DNA page there is an “Invite others to access DNA results” button. Just like the family trees you can invite someone as a guest or an editor. Let’s hope the dear lady in question just did not know how to share results on whatever site she used. We can surely hope she does the right thing — and soon. If two people pay for a company to COMPARE their DNA, do the two people have the right to know the results of the comparison? How much detail do those two people have the right to know? Is it ethical for the company to keep and withhold information about the DNA that those two people share? Is it ethical for the company to use, share or sell the information about the shared DNA while withholding that information from the customers? You already know the answer to this, Jason: it depends. What was the contract between the two people and the company? I would submit that this would s not just a legal question but also an ethical question. To some extent, of course, but mostly to the extent that the agreement is ambiguous or incomplete. Those who test, and those who pay for tests, are not children and need not be protected in all cases from the consequences of their own decisions. They are free to enter into contracts, or refrain from entering into contracts, with terms they are willing to accept. I’m thinking about the ethical issues related to ownership of matching segment data. Who owns those data? Who has the right to sell those data in the form of products such as DNA Circles? Is it ethical for companies such as Ancestry to sell those data in the form of products such as DNA Circles when those data are not made available to the customers who own the DNA that comprises those segments? I don’t doubt that Ancestry is on reasonably firm legal footing with respect to these issues, but I think there may be some unexplored ethical questions in this area. I’m afraid I don’t understand your question. Is your complaint that AncestryDNA is utilizing segment data which is doesn’t disclose, or that some people are getting access to DNA Circles and not others? It’s not really a complaint. I’m asking about the ethical issues surrounding matching segment data: access, ownership and control. I own my DNA data and you own your DNA data — but how much control do we have over what happens with the data relating to the DNA that we (hypothetically) share? I’m not asking this question strictly from a legal standpoint. I’m talking about questions of ethics and fairness and logical consistency. It seems logically inconsistent to say that we “own” our DNA data but someone else has the right to restrict access to shared portions of those data while using the sequestered information to produce and sell products (such as DNA Circles) to third parties. When we say “I own my DNA,” what are we actually saying? That I own the molecules? Some of the segments? All of the segments? The whole genome? The genotyping data? AncestryDNA started out with the notion that they had the right to refuse access to the raw data files. I’m not convinced that their policy on refusing access to segments is any less inappropriate. Maybe this is ethical territory that has not been fully charted, but it seems to be worth serious consideration. Oh I see. This is back to the usual complaints about AncestryDNA and the way it delivers its matches. Fact is, you DO have access to your raw data and you can use it any way you want. What you do not have is access to your matches’ raw data or to see the segments where you match without you and your matches all using a third-party utility. AncestryDNA is not “selling DNA Circles” to “third parties.” DNA Circles are simply a feature of the product which anyone who has tested at AncestryDNA and subscribes to the service can opt into by uploading a family tree and making it public. There’s nothing unethical about having a value-added feature for subscribers, and that’s all this is. We knew when we tested with AncestryDNA that it wasn’t going to be as full-featured for genetic genealogists as other services are in terms of analytical tools. I don’t much like it, but I can’t say I wasn’t warned. Judy, Ancestry is in fact selling access their DNA Circles product. DNA Circles is not simply a freebie thrown in as a thank you gift to Ancestry’s loyal subscribers. DNA Circles is product designed to generate revenue for Ancestry, using DNA segment data to which the owners of said DNA are denied access. To be clear, a subscription to Ancestry is not the only way to access DNA Circles. I was not subscribing to any Ancestry product when the DNA Circles were rolled out. When my Circles appeared, I had absolutely no information about what was inside the Circles. But I thought DNA Circles might be worthwhile, so I looked at my options. The day the DNA Circles product was rolled out, there were two: (1) Pay for a standard Ancestry.com subscription or (2) pay $49 for “Ancestry Insights,” a brand new product designed specifically for people who wanted access to the newly minted DNA Circles without a subscription to Ancestry.com. I chose option #2. What did I get for my $49? Access to the members of my DNA Circles. “Ancestry Insights” does NOT provide access to Ancestry’s standard product including birth, marriage, death and census records. Instead, “Ancestry Insights” provides access to a product built from matching segment data, including data from Ancestry customers who share no DNA segments with me. I am a third party to whom the DNA Circles product has been sold. Like the cousin who paid for the kit and was hoarding the results, AncestryDNA wants tight control. But I don’t think we should be bashful about asserting our rights or criticizing companies that plunge too deeply into ethical gray areas. Jason, you’re kvetching. We all get it: you don’t like what AncestryDNA is doing. Jason, I agree that it might be a little stingy of Ancestry, since from what I understand, the other 2 major services now provide matching services for no extra cost — in other words, the cost is built into the price of the DNA kit. However, I don’t know that you can say it’s ethically wrong or anything. It just effectively raises the price of Ancestry’s DNA offering to $148 for non-subscribers who want to use Ancestry’s database. If Ancestry didn’t allow you to download your raw data file, you could make a stronger case to gripe about. But they do provide YOUR data to you. If you want to use their services to compare data with others, however, you will apparently have to pay a one time fee or subscribe to their normal Ancestry services. Everyone else owns their data, too, and is free to download it and use other services such as Gedmatch to compare data elsewhere (I wish everyone would! ), but again, if you want to compare using Ancestry, I suppose it is their right to charge for that service. Stingy, maybe; immoral, no. Walker, although the raw data file has inherent value, the value of AncestryDNA’s system is not in genotyping but in the evidence of ancestral connections revealed through examination of matching DNA. And yet, Ancestry barely allows the customers who own the DNA to touch that evidence with a 10 foot pole. The donors who supply and own the DNA upon which Ancestry’s system is built are not allowed to scrutinize the evidence for any amount of money. Outrageous behavior! No evidence of civility. Presumably, Judy’s response will be brought to the errant cousin’s attention. Perhaps the writer’s cousin has some personality disorder, or mental problem. I would hope it’s just that the cousin was being thoughtless, George. Judy, do you have an opinion on DNA “phasing” of triads, etc.? I wrote you previously on “Most Bang for DNA Bucks” about whether there would be any genealogical help gained from testing myself if I have already tested my parents. You and I agreed that there would not. However, now I’m seeing people talk about phasing, and I’ve been reading up on it. The most common and “useful” phasing that everyone seems to recommend is 2 parents and a child. Now, I understand that this would help determine which parent the child got parts of their DNA from, sure. Great. But that seems like curiosity only. I understand phasing the child’s DNA with the parent’s DNA would improve the child’s results. But wouldn’t simply using the 2 parents DNA, separately, already provide this improvement and more? Sure, compared to using the phased triad DNA results, using the father and mother DNA results alone separately would have more false positives but also far more REAL matches as well. Right? or wrong? Am I missing something? Thanks for your help. This one seems so obvious it’s a shame it even had to be said. I test a lot of my cousins and I would never dream of not giving them access to their results. Granted, most of them take one look and then tell me to just handle it, but they are entitled to do whatever they want with it. What if the business organization needs your DNA to determine your suitability for a special job, should your DNA and result be destroyed on request? Before the Affordable Healthcare went into effect, insurance companies chose whom to insure and whom not to insure, did they destroy the DNA and its results if they insured or refused to insure you? Even now, do they still have the right to retain your DNA results? Insurance companies have not been able to consider DNA results of any kind in decisions on who to insure since the passage of the Genetic Information Nondiscrimination Act (GINA) in 2008. As for what may have been done with information or samples obtained before that, that sounds like the kind of super-detailed personal question that should best be discussed with an attorney who can give the person involved reliable individualized legal advice — something I’m not doing here in this blog.